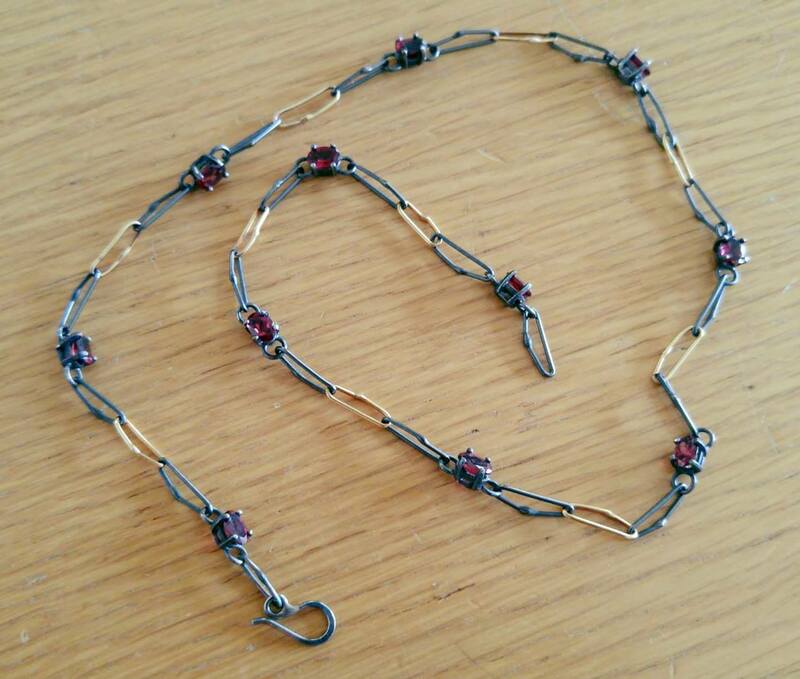 What is it about original, handmade jewelry? Pieces purchased directly from artists, the chance to visit in the studio, to get a glimpse of the process? I am lucky. I own jewelry that has been purchased directly from artists, some picked up in studios, others at art fairs, or online. Weirdly, happily, wonderfully, I have ended up with a number of works, acquired by purchase or gift, by Madison-area artist Teresa Faris. I have wanted to write about Faris’ work for a long time. 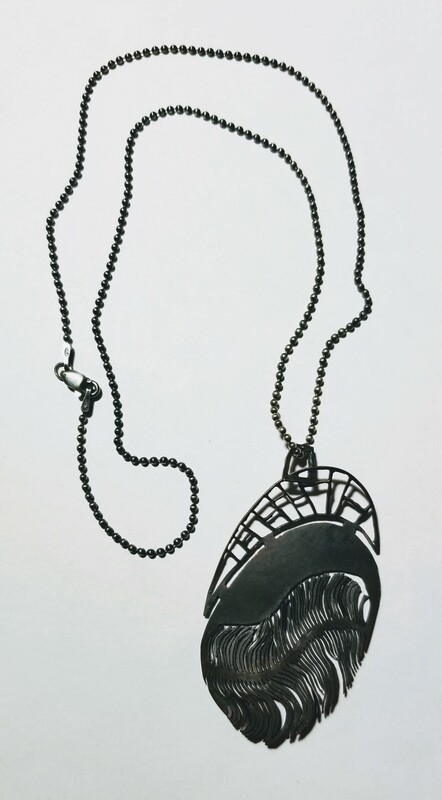 A metalsmith here in Madison, Faris teaches at UW-Whitewater and makes compelling, visually engaging jewelry. She is an artist who works in an art form that can be functional (worn), but who pushes her material and its expectations in decidedly non-functional directions with a process that excavates and increases the medium’s capacity to convey meaning. Faris is not alone in this effort to crack open the world of jewelry and stoke its expressive power. Many artists in recent years have been traveling on this same path. 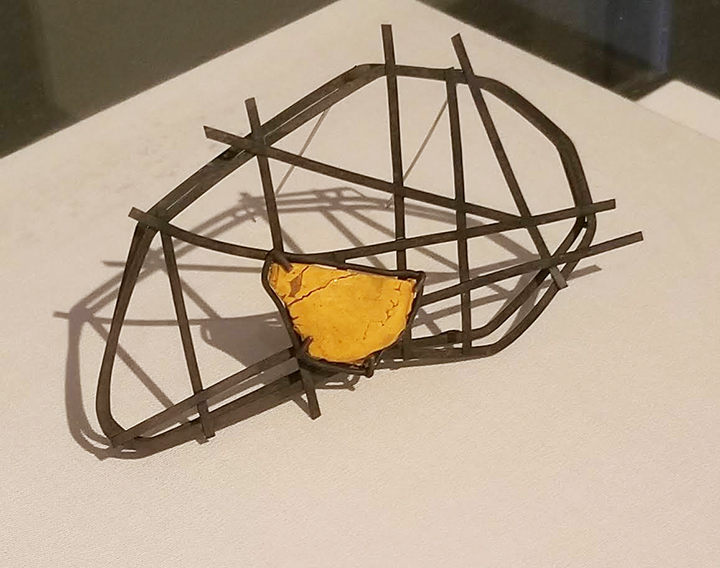 The exhibition that just opened at the Chazen this weekend, Shelter: Crafting a Safe Home (organized by Contemporary Craft in Pittsburgh), includes work by two other jewelry artists who are exploring this same, meaning-laden landscape, Motoko Furuhashi (another HSU grad!) and Demitra Thomloudis (an SDSU MFA). Although centered on different issues, all three of these artists utilize metal, in combination with other materials, to expand beyond beauty and decoration. In their work they contemplate physical space, personal identity, and the expressive power of experience, process and making. In Houston Yellow Tape Project, a work included in the Shelter exhibition, Thomloudis presents a street map of a neighborhood that identifies only sites where homes have been torn-down. The map is enhanced by individual jewelry pieces that hang from the highlighted lots. The jewelry is an unexpected addition to the map, acting almost as game pieces, like the small metal shoe or top hat place-holders that occupy squares, indicating presence on a Monopoly board. Here they hang in front of a simple graphic of streets and lots. 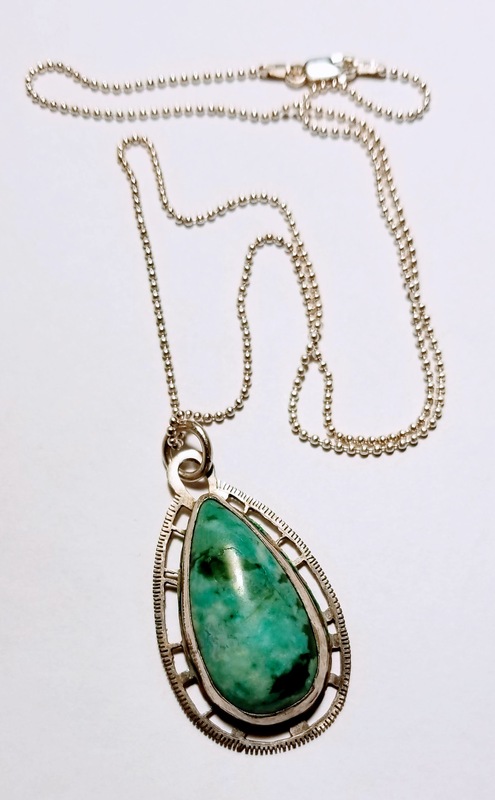 Some pieces are obvious as jewelry–pendants on chains, necklaces, brooches–but their materials deny expectations: some are constructed out of upholstery foam, others distressed wood, plastic, or unknown items. The individual pieces are crafted of debris from the houses whose sites they mark. Thomloudis has gathered specific construction detritus and created functional works. The works serve as memorials to the demolished homes and to the neighborhood’s loss. 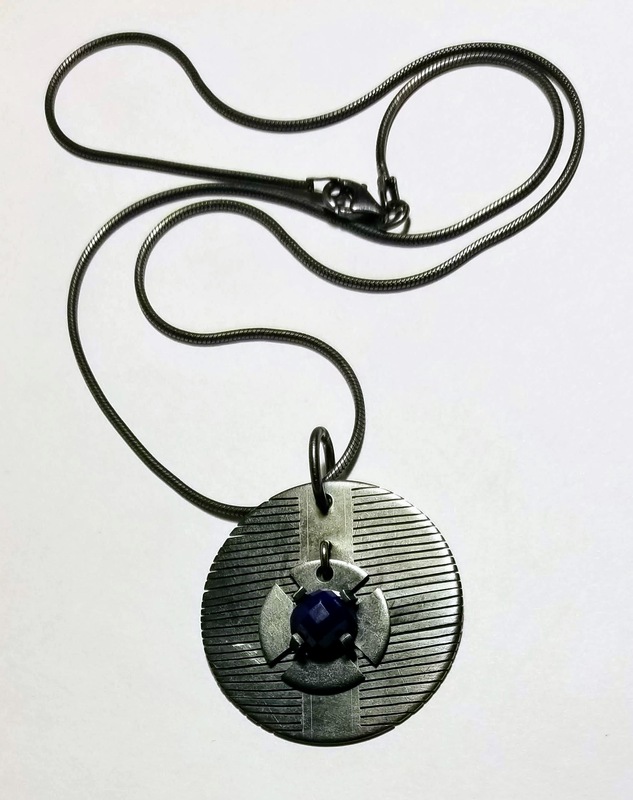 They also, according to the artist, are intended to provide points of connection between people when worn, as conversation starters, as a means to connect and educate and share stories of what is gone. Furuhashi is interested in similar ideas of place and specificity. 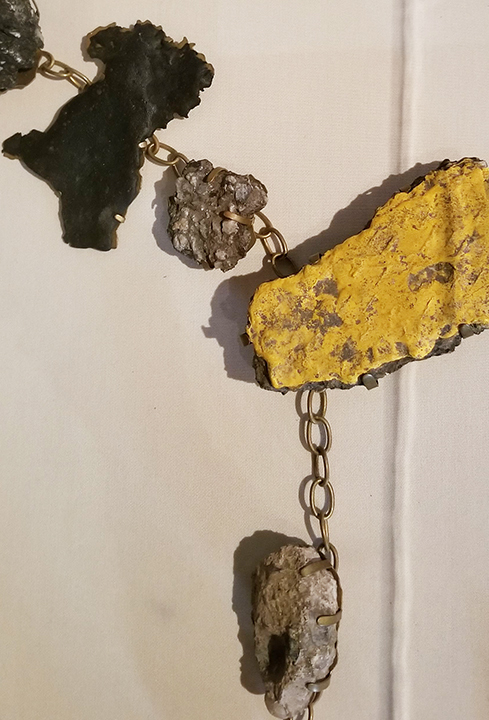 The brooches and necklace that are included in the exhibition do not indicate loss, but rather utilize overlooked materials to redefine a sense of place. 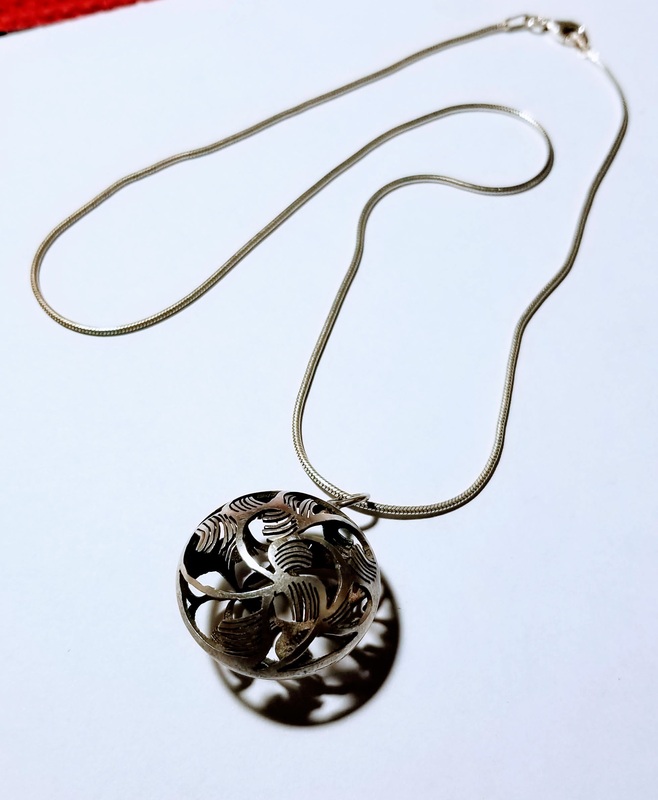 The artist takes map views and translates them into jewelry supports: street grids become the structure for brooches or the underlying organizational scheme of a necklace. The works are bejeweled not by precious stones, but by chunks of asphalt and concrete that have been excavated from locations noted within the mapped sites. In combining a bird’s eye perspective and site-specific materials, Furuhashi creates abstracted portraits of places. Physical experience is represented in these works: a locating of self within a particular time, a network of streets; the steel and asphalt that support movement through the space are humble yet ubiquitous and powerful materials, they shape and underlie every passage. Faris explores not a physical site but instead an emotional landscape. She finds meaning in intricate labor: crafting chains, sawing, riveting, and punching to create a calming, meditative space. In her work, the artist’s repetitive motions are related to the chewing and carving activity of a captive animal, specifically, the cockatoo who shares her home. Incorporating the brightly colored chews into elaborately sawn metalwork, Faris makes Collaborations with Bird, a series of works that pairs the productive output of co-located beings. Anxieties about personal well-being are considered in human and animal terms, equated, and found to be analogous in expression. A similar focus on repeated actions is evident in a more recent series, CWaB:Lien. Exploring ancestral debt and assimilation, these works are punched and dapped, then soldered together into large swaths of small circular forms. The end result is stunning: glittering, seemingly cohesive silver bits connected into what appear to be sturdy medallions. But are they solid? What is behind that process of connection, integration, of piecing together, of fitting in? What is omitted in the creation of a homogenous group? What, if we consider our debts, is our inherited legacy? It is this focus on the overlooked or unconsidered that connects the work of Thomloudis, Furuhashi, and–although not part of the Shelter exhibtion–Faris. All three artists utilize jewelry to refocus attention, to turn away from decoration towards more complex considerations. Not items merely to be worn, the pieces are meaningful because of their external referents–they are visually arresting and conceptually weighty. These metal and wood constructions relocate the wearer: we are moved away from surface beauty to a place where personal adornment becomes a powerful intellectual presence that conveys astonishing expressive potential. (update: listen to an interview with me about the Shelter exhibition that aired on Sunday Afternoon Live, December 1, 2018). (update 2: see a blogpost on the textiles in the Shelter exhibition, on the Chazen Museum of Art website). Lucas Koehler Combo, Union Hair Parlor, ALL Jazz Fest 2018, Schenk’s Corners. On top of a recent realization about some professional fails, mostly surrounding communication and an inability to see clearly, the other day I took 10 minutes and three trips down the hall to print one shipping label. This was yet another clear failure: too much time to complete a (usually) simple task. As failures go–especially when compared to the rest of the day’s realizations–the label printing was relatively low-impact: a time-waster and frustrating, but that’s about the extent of the damage. Luckily the day ended with some local jazz: #thebestjazzisinhairsalons fully expresses the restorative, rejuvenating, community experience that provided me with much-needed perspective and release after a difficult week. Of course there are other failures, some of remarkable scale, with a much much larger impact that can’t be remedied by jazz, no matter how awesome the music. A highlight of my difficult week was the opportunity to hear from someone who headed up one such spectacle, Jim Lasko of the now-closed RedMoon Theater. In a conversation with the Chazen’s director, Amy Gilman, Jim talked about the social impulse of his theater work which, at RedMoon, took the form of taking theater into the neighborhoods and streets of Chicago, in his words, “engineering new ways of being together.” The motivation was to make theater more accessible and bring performance to bigger, different audiences. But Jim was not at the art museum to talk about street theater. He was invited because of what has been identified as a massive fail: the Great Chicago Fire Festival of 2014. I won’t rehash the story here, as it has been amply covered elsewhere–Jim has even talked and written about the event and the aftermath. I am more interested in his process of recovery, how he moved forward, and his perspective on creative work. Jim talked of theater as a living activity, he compared it to a group jumping out of an airplane. With opening night the equivalent of the ground quickly approaching, the group has to work together intensely, and fast, to prevent disaster. The joy and excitement is in that process of making, of attempting and failing and trying again. It is thrilling, it is inspirational. We make art because we have to, we are driven to keep attempting it over and over. We fail every day, which is an important thing to remember as we get up and try again. But aside from the daily face-plants, in the wake of massive fail, what makes us pick up the pieces and try it again? After the closure of RedMoon, Jim says he talked to many people about his next steps. He talked about failure to corporate groups, and he returned to work on an unfinished PhD. Recently he teamed up to open a new maker and gathering space called GuildRow. After the presentation I was able to ask Jim about the recovery, the aftermath. He had talked about it in personal terms in the conversation on stage, but I wanted to know how his team responded, and how they, as a group, recovered after hitting the ground so hard. After some thought he revealed something about the theater company that was striking: he said they worked through the difficulties because they loved each other. A company like RedMoon that was dedicated to bringing theater outside, into neighborhoods, and making it participatory, this company was comprised of intensely committed individuals who fiercely loved their work. They ran on a personal devotion to shared goals and to each other. This is not, of course, every organization. But it seems completely reasonable, maybe even necessary, for a non-profit street theater group. I am intrigued that Jim emphasized the personal in his presentation. He was not there to talk about failure. His comprehension is contrary to the corporate lingo approach to failure which, through it’s focus on venture capital, minimizes and even erases the personal–the pain and suffering, the lived experience, the frustration, anger, and confusion. But in Jim’s telling was a sense of a community, not only within the active theater company, but following the disaster. He described turning to his personal community to assess and advise, to consider and imagine. This was a way of doing important individual work, human work. It is restorative, it is personal, and it is vitally important. Which takes me to a different theater project that I was lucky to witness recently, here in Madison. Lines: A Theatre LILA Invention is a collaboratively written play that gives voice to five female playwrights of color. The play was a complex intertwining of stories, with actors playing multiple roles. The beauty of the play was not only in the acting, the staging, and the direction, but in the stories that were told. These are voices that are rarely heard in theater: beauty shop conversations, playground interactions, hopscotch, hope for the future, lovers’ arguments, the daily dangers of being a woman, black, lesbian, latina, muslim, young, or even middle-aged. It was a play that conveyed the personal, but also emphasized the importance of connections and the potential of community, not only in how the play was created or what was represented on stage, but in the conversations with the audience that followed. This is the same force behind Jim Lasko’s theatrical efforts: a desire to connect. In moving performance outside into the street, or by collaboratively developing a script with other writers of color, these efforts expand the reach of theater. They breathe in deeply and open their arms, inviting more people into their embrace. They grow the audience. Although connections can be uncomfortable, as with some of the questions that were asked during the talkback after the Lines performance, or in the direct personal challenges that were issued during the play, they are essential for the success of art making. I imagine that for some people, like those who enjoy the anonymity of a dark theater, RedMoon’s street performances would have been quite difficult. But connection takes many shapes. Engagement may be a buzzword, but we use it for a reason. Lasting impressions–wonder–happens when people are able to connect, with each other, with art, with music, with something outside of themselves. These theater efforts are so different, yet both relied on the very personal dedication of their members. Understanding this devotion and commitment transforms notions of success and failure. A fizzled public art event is insignificant when the connections created through it, or the exhibition of an artist’s work, a collaborative theater event, or even a jazz celebration (pictured above), are prioritized. Instead of focusing on failure, maybe it’s is more important to foreground engagement and connection, and their restorative, sustaining potential. Who did you connect with today? We fail daily, but so do we achieve. Connecting every day, staying engaged, that’s the hard part. But when it happens? Wow.